Diwali and Govardhana Puja Celebrations - All Weekend Long! ~ The Toronto Hare Krishna Temple! Diwali and Govardhana Puja Celebrations - All Weekend Long! This next several days at Toronto's Hare Krishna Centre are incredibly busy with the festival season upon us! Festivities start off this Friday, October 24th with s HUGE Govardhana Puja and Diwali Celebration, starting at 6:00pm. Govardhana Puja is celebrated the day after and Diwali and on this day the inhabitants of Vrindavan (Lord Krishna’s abode on Earth) would hold a harvest festival in honour of King Indra, the demigod who provided the rains essential for the harvest. One day, however, Lord Krishna wanted to teach Indra a lesson. 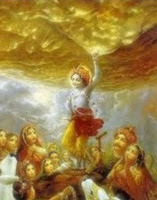 He convinced the inhabitants of Vrindavan to honor Govardhana Hill instead, whose fertile soil provided the grass upon which the cows and bulls grazed, and to honour the cows and bulls who provided milk and ploughed the lands. Stay tuned about more details over the weekend!